it is very different from a frozen photograph. A major difficulty in learning the violin or viola is that we cannot see what we are doing. Both arms are outside our field of vision and moving in completely different directions. There might be pictures in our books which demonstrate the correct positions but most of these cannot show us what we will see as we play our own instrument. There is a desperate need for visual information at the beginning of any complex learning process. The student can only attempt to imitate the teacher, dependent on teacher feedback as to whether the imitation has been successful. Usually there are subtle corrections made by the teacher, the pupil then adapts and tries to remember what changes should be made. Perceptual agreement between the teacher and student is the goal. Of course, when the student returns home to practice, there is no teacher present and it is quite probable that many of the movements will be practiced incorrectly until the following lesson. The next lesson will repeat the same process. There seem to be many corrections that have caused confusion and student confidence may begin to fall. The teacher will then probably suggest the use of a mirror. That certainly could help but unfortunately the mirror image is perceived as the self image. Every time the student looks in a mirror there is an awareness of ‘me’ and all that is associated with that image. Also, using a mirror is very distracting while playing unless the music is memorized. Even then, both tactile and auditory information suffer as one turns one’s attention to the mirror. Video has the potential to completely circumvent these problems. Through the consistent monitoring of our recordings we are able to directly influence our thinking and psychological make-up, greatly accelerate our learning, and perform with much greater confidence. Video has the ability to give us the distance that we need to objectify our perspective of our playing. We can imitate our teachers using video, and, if we save our recordings, check our development in practice. We can use slow and quick motion to see what is really happening. We can magnify any movements of our hands that we want to see. and record … and record again. Finally, we can just play without any recording and just listen and feel. We will have all of the visual information we need and can turn our attention elsewhere. When I was a student in Philadelphia, Pa., I was a member of Max Aronoff’s Technique Class. The class met weekly in the Concert Hall and consisted of advanced string students and a few professional orchestra musicians who were Max’s ex- students (and whom the rest of us students idolized). Max had a number of ‘diets’ that were not at all related to food. These diets were special courses of action which one diligently applied to gain mastery over a technical challenge. One of the first ‘diets’ that I learned was for left hand agility and 4th finger mastery. Once learned, the 3 patterns are to be combined and repeated up the C/G (G/D) strings in ascending positions until one reaches the octave of the first note. Pattern 2 … all of the above rhythms are repeated with this pattern. Pattern 3… again, repeat all of the above rhythms with this pattern. Not only are these exercises great for the left hand but the bow is practicing smooth string crossing. This is a demanding ‘diet’ but the results are well worth the discipline. While watching an old video that an adult student had given me, I came across a unique, warming up exercise that Jascha Heifetz used in his own personal practice. It occurred to me that this would make a great exercise for my students. The Heifetz rendition was a bit random and fast paced so I decided to simplify some of the main concepts before introducing the exercise. I demonstrated the exercise to approximately 8 students. The following week, we all began our lessons with our ‘Heifetz’ warm up. I mirrored their efforts in the background. Much to my surprise, at the end of two weeks of teaching the exercise to my students, I noticed such a difference in my own finger strength and articulation that I have made it a permanent part of my left hand warm up. Since some of my students are learning basic rhythm, I have adapted the original exercise to include subdivision of the basic beat. And for myself, I have exaggerated the stretches to improve my reach on the fingerboard. It had been a few years since I had last seen my teacher, Jascha Brodsky, and it was great to just relax, have a cup of coffee and catch up. Our conversation eventually drifted to pedagogy when suddenly, he became very animated. He said he had just witnessed the best lesson he had ever experienced in his whole life. 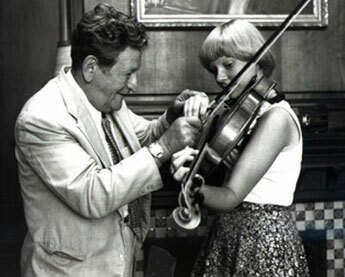 Mr. B. was very good friends with Ivan Galamian and had been invited to sit in on a lesson that Galamian was giving to a new pupil at the Curtis Institute. According to Brodsky, the student came into the studio with his violin, bowed politely and said that he had prepared the first movement of the Bruch Violin Concerto in g minor. Galamian nodded, introduced Mr. B., sat down and asked the pupil to begin playing whenever he was ready. Why do you think that this was such a great lesson? Surely Galamian could have easily spent the whole lesson on interpretation, on bow technique, etcetera. But Mr. B. thought that Galamian was very wise, less is more, the student would never forget Galamian’S few pointed words of advice. Playing the same selection continuously for the entire lesson in front of a critical audience was also a most valuable personal experience for the student. I have recently received a number of questions regarding the frame of the left hand and the position of the first finger. I thought I would share one of my favorite exercises which sets the hand and the first finger, increases dexterity … and strengthens the fourth finger as well. As violinists, we search for a comfortable playing position. Since many of us lack that ‘perfect hand’, we need to find and mentally set our our basic position so we are able to reach all of the notes with the greatest economy of motion. I believe that the fourth finger, being the smallest finger, must be set on the fingerboard for this to happen. Try the following exercises and see if they help you. I have adapted Sevcik’s School of Violin Technique, Opus 1, Part 1, # 1, by adding a silent 4th finger to stabilize and mentally clarify the inner and outer frame of the hand. To begin, place the fourth finger on the E string. Play the four notes on the A string slowly, I suggest you repeat that first measure 4 times, adjusting the intonation and feeling any stretches between your fingers. Remember that the bow plays only the notes on the A string while the fourth finger remains silently on the E string. The following rhythms should then be repeated 2 times each. Remember to release any tension in the thumb at the end of each measure. The fourth finger remains on the E string. If there is difficulty with the second finger stretch you may want to begin with a C#. More advanced players can experiment with other finger patterns. extended backwards to reach the B or Bflat. By the time one reaches the third measure, the fourth finger moves to the A string and is able to play effortlessly as the hand is now balanced with the fingers over the notes. With practice, hopefully the hand will soon ‘remember’ where it is supposed to be. How long can you play a Down bow? How about an UP bow? 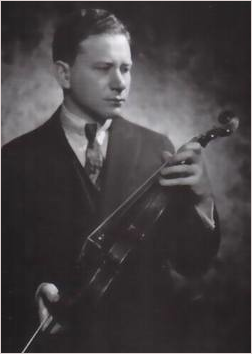 Efrem Zimbalist, Sr., would open the doors of the famous Curtis Institute in Philadelphia and begin his daily morning practice on his violin. By the time the students had arrived, he was well into his scales with his one – minute bow per note. Needless to say, even 40 second bows are less than satisfying to hear and the sounds of his humble practice were the first sounds to greet the students as they arrived. There were some humorous remarks exchanged between students but never anything that reached the master’s ears. A bit of history … Zimbalist, noted Russian violinist, composer, conductor, and teacher was the director of the world famous Curtis Institute from 1941 to 1968. Only the finest and most gifted students from all over the world are accepted at the Curtis Institute of Music. Although Zimbalist officially retired from playing when he was about 60, he played the Mendelssohn Concerto with the Philadelphia Orchestra to celebrate his 80th birthday. It was a concert we will not soon forget. Obviously, his one – minute bow worked. First of all, you need to set your metronome at 60. Next, place the bow very close to the bridge … begin to move as slowly as you can. Sustain the same speed of bow throughout the entire stroke. Holding the bow firmly,try to keep the same pressure at the point of contact throughout. Be patient with your sound, maintain your focus and be aware of what is happening as you count each second. Enjoy your disciplined, steady meditative approach, and know it brings results! There is some controversy about how to learn to play a passage fast. Should we not play the selection slowly and then, using our metronome, gradually increase the speed until we can reach that final tempo? If you follow that procedure exclusively, you will spend most of your practice time playing at a speed other than your final tempo. 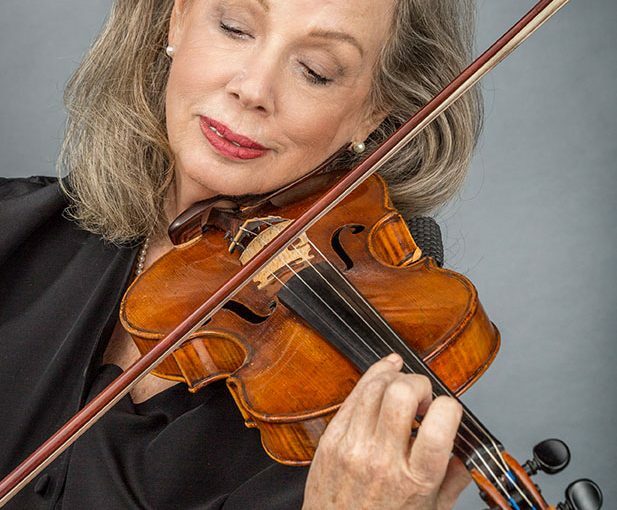 But, as violinists, our finger and bow connections change substantially as we vary speeds … We need a method of preparation that focuses on the repetition of our exact movements at the final tempo. Try the following method for this fast détaché. If it works for you, add it to your practice toolbox. Here is an excerpt from the famous Paganini Perpetuum Mobile. Play through the above selection very slowly in mid-bow, using a tiny amount of bow. You want to imitate the amount of bow you will use when you are playing it at fast speed. Keep the left hand fingers as close to the string as you can. A.Set your metronome for the final speed you would love to play and follow the notation above. Play near the middle of the bow, tiny bows … left hand fingers close to the fingerboard. B. Next step, same speed, tiny bows, lift and retake bow in rests. Pay close attention to what happens in string crossings. C. Same speed, add another group of 4. Listen carefully to intonation. D. Same speed, add two more groups of 4 and rest. E. Same speed, two measures, rest at the end. we can play 4 measures/rest, etcetera. refining your sound, intonation and string crossings. Keep in mind that you are always practicing at final tempo. How to tackle those mistakes head on! What do you do when you keep stumbling over that same difficult spot in your practice and you think you’ll just never ‘get it’? A teacher might help you solve the problem but … what if there is no one around except you? You might take the time to analyze what the problem ‘may’ be. But many times it is not a thinking problem, it is just a doing problem. Try the following and see what happens. First, go right to the exact spot of the problem. This will be your final destination. Start to play only that note or notes at the preferred speed in the right part of the bow until you are comfortable. Now, back up and add just one note before the problem note or connection. Make both notes feel and sound good. Take care that you use the correct bowing! If you practice the wrong way, you won’t get the same results. Time to add a few more notes before … always ending with your destination note. Continue this until you have worked your way back to the beginning of the phrase. You may have to repeat these steps for the next few days. It is easy to see that we are practicing that destination note many more times than the other notes. We are also reducing the anxiety travelling to our destination note by becoming very familiar with the territory, how it feels, how it sounds, how it looks on the page. Always practice backwards from the mistake to the beginning of the journey. When we practice ‘from the mistake’ and add the connections ‘before the mistake’, we have a much better chance of success. Enjoy! Here is a quick, no nonsense finger stretching warm-up that allows you to start playing immediately with greater safety and confidence. Less advanced violinists should simplify this exercise by placing all fingers on the same string. Remember to take it easy as you begin, no over stretching allowed. If you start with small easy stretches, your hand will gradually tell you when you can reach out just a bit more. If one were fortunate enough to study with well known violinist and teacher,Raphael Bronstein, one heard many, many times during the lesson, “No, no, Z note! Z note! Z note before”! As New York professionals, we used to laugh and tease each other with this well known quote from lessons with the master. But what a difference this advice made in our playing! When we became aware of exactly what Professor Bronstein was trying to do with such persistence, our performance changed dramatically for the better. We gradually became more sensitive to other examples of ‘Z note’. How about ‘Z note’ before the string crossing? ‘Z note’ before the bow change? ‘Z note’ before the sudden change in dynamics? ‘Z note’ before the dreaded fourth finger? These new possibilities all opened up more technical control and gave us increased ability to shape the musical phrase the way that we wanted. ‘Z note before’ … three very powerful words.Professor Bronstein’s simple formula continues to give us the ability to take control of our basic performance anxiety and create better music. Listen to Z note before, share and enjoy! Copyright copy; 2016, ViolinSync - All rights reserved. Website by BizMarquee.com, Inc.